From ancient times, Japanese common people have delighted in the culture of engimono (good luck charms). Decorations, foods, talismans, festivals, and even performance artists at festivities can be engimono. Traditional limbless dolls called Daruma are very popular Japanese engimono. Daruma imitates the zazen (seated) posture of Bodhidharma, the founder of a Zen Buddhist sect, who sacrificed his mobility over nearly a decade of meditation. A Japanese proverb Nana-korobi ya-oki can be literally translated “If you tumble down seven times, stand up eight times.” (Life is full of ups and downs.) Attributed to Bodhidharma, this proverb has come to symbolize the perseverance of Japanese people. 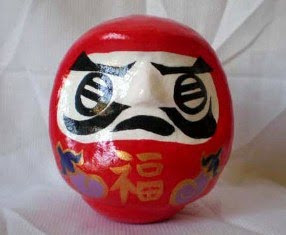 Since Daruma dolls are designed to return to upright position if tipped over, they personify the spirit of Nana-korobi ya-oki. 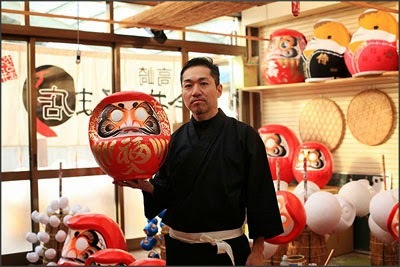 Daruma-ichi (Daruma market) is held in Takasaki on January 6 and 7, drawing over 200,000 visitors each year. People visit this place and purchase Daruma to express gratitude for safety in the past year and hopes for good fortune in the coming year. Daruma dolls accept people’s wishes and watch over their daily lives with affection.